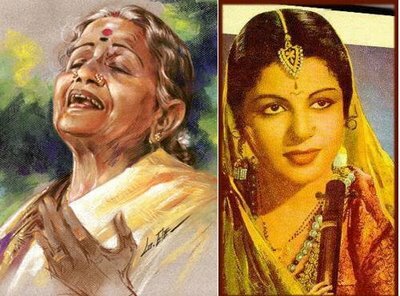 The Google doodle today honors M.S.Subbulakshmi (1916~2004) on her 97th birthday. I don’t understand the nuances of music (the ragas, the construct, the delivery style and such) like most others do, but I love music and do know to appreciate when soul goes into producing great performances. And I believe MS’ soul was always on a song. For when she sang, she became the music. There was no more MS. Just the music flowed and swept away all those who listened to her. As a young boy who took public transport to school, I have waited several mornings outside MS’ home (where the bus stop was located) on Village Road, in Chennai. I remember having seen her on a few occasions, stepping out into the courtyard to water the tulasiplant. I only knew of her then as a great musician that the world adored. It was when she was decorated with the Bharat Ratna (India’s highest civilian honor) that I saw the exceptional human being and the embodiment of simplicity and humility in MS. For all the adulation, praise, rewards and recognition that came her way, she remained unaffected. All she knew was that her soul sang. And she let it sing whenever it felt like it. My impression of this side of MS was validated when, soon after her passing away in December 2004, The Hindu ran a series of tributes. Among them was one by M.Krishnaswami, Chairman of the Sri Thyagaraja Trust. He recalled an incident when the Tirumala-Tirupati Devasthanams (TTD) had invited MS to perform to commemorate the then Prime Minister Lal Bahadur Shastri’s visit to the famous shrine. The morning after her magnificent concert, TTD’s senior officials called on MS and requested her to accept the title of the TTD’s Asthana Vidwan (Court Singer) – a honor no one had ever been offered till that date. She was the first to be offered it. Krishnaswami, who was present at that meeting, reported that MS graciously declined to accept the honor. She told the TTD delegation that it would be improper on her part to accept this title when so many senior musicians, all of them stalwarts, had not been honoured with it. She named Ariyakkudi Ramanuja Iyengar, Musiri Subramania Iyer and Semmangudi Srinivasa Iyer, in particular and said she revered these gentlemen and would not be able to accept an honor ahead of them. The TTD Team was touched by her thoughtfulness and decided to honor these senior artistes as well along with MS. That anecdote has left a deep impact on me and has, I believe, contributed to my evolution. All of us crave for recognition. This craving comes from the feeling that we have created or achieved something and, therefore, we need to be celebrated for it. Nothing wrong with this thinking. Except that it will also be pertinent to remember that our lives happens through us – and not necessarily because of us. Whatever we create is an expression of what we are endowed with. We don’t make the music we render. It merely flows through us. We are but instruments. The stage is “given” to us. The music – the reference here is to any chosen vocation or craft that we pursue and is not limited to music – is “given” to us. We are mere delivery agents. Just as a courier delivery person cannot take credit or responsibility for the quality of communication, she or he is delivering, we too can’t. As long as we understand this truth and remain anchored with it, we will always be grounded – we too then will be unaffected by praise (or criticism) when it comes our way. When we discover how to be untouched by success (or failure), we would have found inner peace and bliss! Here’s MS’ rendition of Hari Tum Haro…have a great week ahead!